Prison artwork created by Adnan Syed sits near family photos in the home of his mother, Shamim Syed, Wednesday, Dec. 10, 2014, in Baltimore. Adnan Syed was convicted for the 1999 murder of his ex-girlfriend, and his case was revived in a wildly popular podcast with millions of weekly listeners. A man whose murder conviction was recently vacated after his story was at the center of a popular podcast will remain jailed while he awaits a new trial. Baltimore Circuit Judge Martin Welch on Wednesday denied Adnan Syed's request to be released from jail primarily because there is a pending appeal from the prosecutor's office. Syed was convicted in the killing of his high school girlfriend, Hae Min Lee, and sentenced to life in prison in 2000. 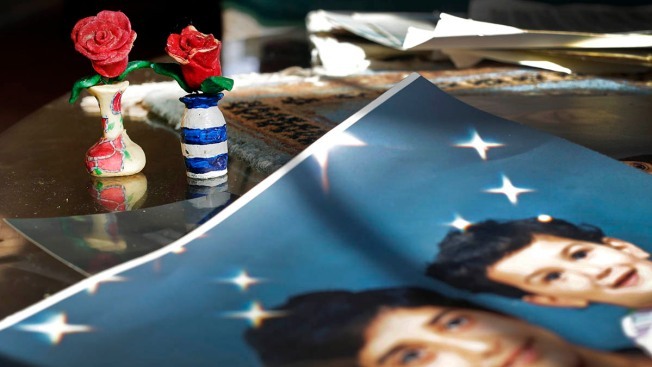 Syed's case was the centerpiece for the first season of the 2014 podcast "Serial." Syed was granted a new trial last summer because his original trial attorney failed to cross-examine a state witness who presented possibly unreliable cell tower data linking Syed to Lee's burial site.